Ornithogalum thyrsoides growing herbaceous geophyte of the genus Ornithogalum also known as Star of Bethlehem flower or Chinkerinchee, Ornithogalum thyrsoides perennial deciduous plant also used as ornamental cut flower fragrance plant, can grow in mediterranean, desert, subtropical or temperate climate and growing in hardiness zone 6-10 (possible to keep the bulb in the soil) 4-7 (possible to keep the bulb over the winter indoor). Leaves color green in linear shape and grow from the bulb. Flower color white in the middle there is darker spot, the flower shape it’s like star with 6 elliptic petals, the flowers grow on stalk. 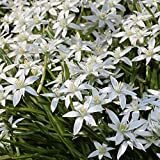 Ornithogalum- 'Sochi' (5 bulbs) is a rare star-of-Bethlehem with star shaped glistening white flowers.